You can pretty much classify most hydroponic systems under two categories. They are either an active system, meaning the water and nutrients are pumped to the plants mechanically, or the system is considered a passive hydroponic system that relies on capillary action of either a wick or the growing medium itself. There are advantages and disadvantages of each type, as with most things in life, it is a trade off and you should take the time to understand the pros and cons of both before making a choice. As you start researching different hydroponic setups, you will also see them listed as a recovery, or non recovery system. This indicates whether or not the system recirculates and reuses the nutrient solution. A wick system is an example of a non recovery type of system. There are no moving parts in this type of hydroponic system as the water is carried up the wick to the plants and is not recovered. These type of systems are actually quite popular because they utilize a submersible pump to transfer the water from the reservoir up to the plant tray directly. Any excess water then drains back down to the reservoir to be used again on the next cycle. Because the nutrient solution is moved mechanically, and the excess is recaptured, this type of system would be called an active recovery system. It really is quite a simple design and it operates on a basic principle of flooding and draining the plant tray. The submersible pump located in the reservoir is connected to a timer so that you can precisely regulate the watering cycles of your hydroponic plants. During the flood cycles, the pump is turned on for roughly 20 to 30 minutes where it then pumps the nutrient solution from the reservoir, into the tray holding the plants. This method feeds the nutrients directly to the root systems of your plants, from the bottom up. Once the cycle has completed its timed run, the pump will shut off automatically and any excess water will drain back into the reservoir. These hydroponic setups also have overflow drains built into the tray that feed back into the reservoir. 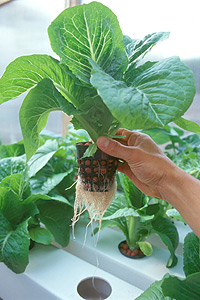 This technique is also referred to as an NFT system and would be classified as an active recovery type of hydroponic system. This system also utilizes reusable nutrient solutions. A submersible pump in the reservoir pumps the water and nutrients into grow tubes that have the plant's roots suspended inside. The grow tubes are angled slightly downward allowing the excess nutrient solution to drain back into the reservoir. In hydroponic setups like this, the nutrient solution could be set to flow over the plant roots as long as 24 hours each day. In order to provide the required amount of oxygen in the grow tubes, these systems require the use of air stone or capillary mats to properly aerate the nutrient solution. This system does not require the use of any growing medium as the plants are supported either by a collar or a growing basket. While an NFT hydroponic system is extremely efficient and effective, many hydroponic growers just starting out find the system a little difficult to use and fine tune. Also without the use of a growing medium to help retain moisture, the system can be very unforgiving as any prolonged interruption of nutrients to the roots can cause them to dry out, possibly killing the plants. Wick hydroponic systems are by far the simplest type of systems to use as they require no pumps and have no moving parts. They are considered passive non recovery type systems because the nutrient solution is only absorbed as fast as the wick and growing medium can absorb, and there is no excess solution to be returned to the reservoir. Wick systems are inexpensive and easy to maintain and setup, however because they keep the growing medium constantly wet, they do not maintain optimum oxygen levels and they are not the most efficient way to grow plants hydroponically. 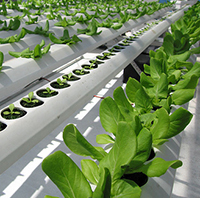 Continuous drip hydroponic setups can be used as either active non recovery, or recovery systems. These types of systems utilize submersible pumps in the reservoir, with supply lines that are ran to each plant. At the end of each line is a stake that goes into the growing medium and there is a drip emitter built into each stake. The grower then regulates the drips to control the flow of nutrients to each plant. 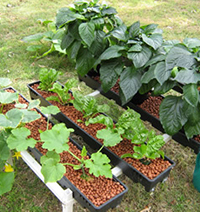 A tray under the plants can be used to route the excess nutrient solution back to the reservoir, or you can simply allow it to leach out into the ground where applicable. 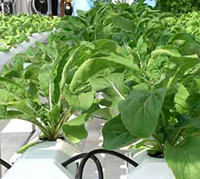 While hydroponic systems are more or less fairly simple to construct, if you are just getting started with this type of growing, it is highly suggested that you purchase an inexpensive system to get a little experience growing hydroponically first. Wick systems are pretty inexpensive and widely available and even though they are not the most efficient systems, the experience you gain using them will be well worth the investment. Once you have learned the process and feel comfortable with all the components, you can pick up the required components and begin constructing your own hydroponic system based on your requirements. While the mechanics of hydroponic growing are simple, there are numerous layouts and configurations that you could start with, depending on what type of plants you are looking to grow. All you need is a little ingenuity and a modest budget, and you can find most of the components you need at the local hardware store or garden center. 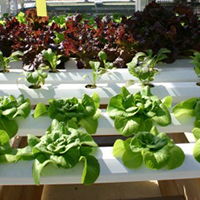 Be sure to read some of our other articles pertaining to hydroponic gardening.